Are you looking for some eye candy the next time you paddle your board? Do stunning backdrops, snow-capped mountains, mangrove forests, alpine lakes, lagoons, emerald-green rivers and tropical beaches tickle your fancy? 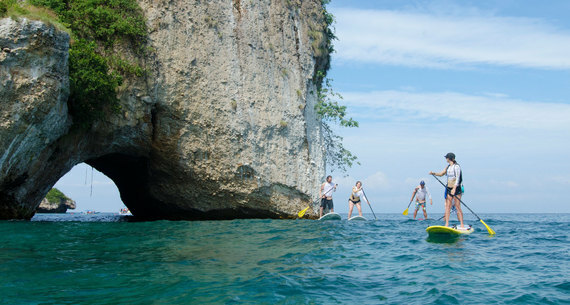 Then you're in luck because the world's stand-up paddle boarding hotspots have them all! To help you find your next SUP oasis, here is a list of the world's most epic stand-up paddleboarding trips you absolutely need to take in your lifetime. You can never go wrong with the birthplace of stand-up paddle boarding -- Hawaii. Sunset Beach on the north shore of Oahu is famous for its big wave surfing during winter. During summer, the waves are smaller and friendlier, just perfect for paddle boarding. Those seeking a bigger challenge can paddle from Sunset Beach all the way to Waimea Bay, a 4-mile (6.5 km) trip. Sunny and warm Oahu has plenty of other SUP spots worth hitting, like Puaena Point, Haleiwa, and Lanikai Beach, which are favorites among stand-up paddling beginners. Water temperature in Oahu is usually a pleasant 80 °F (27 °C). With almost the entire state surrounded by water, it is no wonder that the SUP community in Florida is flourishing. The coral cay archipelago of Florida Keys off the southern coast of the state offers literally hundreds of spots to launch your paddle board. 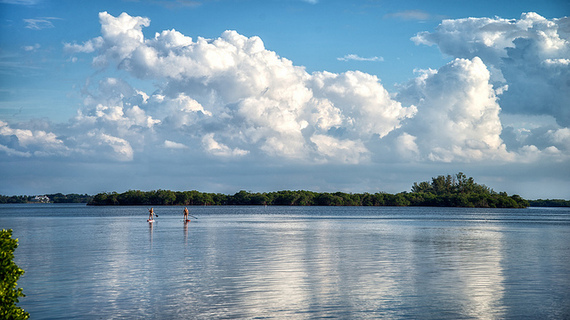 With a rich marine life that includes stingrays and manatees, mangrove forests, a diverse ecosystem and Caribbean-like waters, Florida Keys is an island paradise that's best explored on a kayak or SUP. Paddleboarders can take advantage of the trade winds to cover long distances. When there's no wind, the paddleboard can be used for fishing, SUP yoga, meditation or simply gliding in a slow, laid-back pace. Back on land, Florida's Fort Lauderdale is often referred to as the 'Venice of the East.' Its winding canals that empty in the Atlantic make it one of the most scenic SUP destinations in the USA. With over 9,000 miles (14,500 km) of coastline, azure waters and sandy beaches, Mexico is one of the best surfing destinations on the planet. Quality surf awaits on both the Pacific coast and the Gulf of Mexico, and there's always a cool wave to catch throughout the year. With lakes, rivers, a maze of waterways along the rugged central coast, no wonder B.C. has a thriving SUP community. There are so many amazing spots to paddle it would be tough to list them all. So we'll just mention what we believe are the best -- the coastal waters of Tofino, Kalamalka Lake in Vernon, Muncho Lake, Emerald Lake, Whistler and the west side of Vancouver are the places to start for a scenic SUP adventure. North America's largest alpine lake is perhaps the most photographed SUP location in the world. And with good reason -- its mesmerizing blue water, 72 miles (115 km) of shoreline covered in coniferous trees and the snow-capped Sierra Nevada Mountains in the background make it a dream destination for a variety of recreational activities. What better way to enjoy this natural beauty than on a laid-back paddle boarding session? The crystal-clear waters of Lake Tahoe offer an astounding visibility of up to 70 feet (21 m) down on a good morning. Conditions are great from late spring until early fall, and the best time of day to paddle is in the morning or early evening. That's when the surface is calmer and the winds are gentle, ensuring an intimate experience. These conditions are also ideal if you're a beginner. 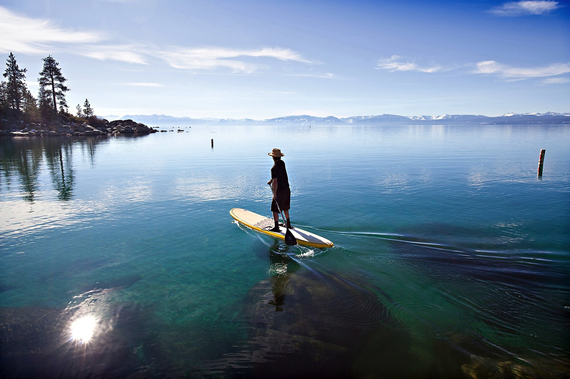 Lake Tahoe is the venue of the annual Tahoe SUP & Paddleboard Race Series, an annual event worth attending if not even participating in.